Grace Bradley has passed away, and although her name will not be known to many, she was a Paramount contract player, starred with Bing Crosby in TOO MUCH HARMONY(1933), and was the widow of Hopalong Cassidy. She was 97. She was born on September 21, 1913 in Brooklyn, New York. On December 22, 1930 Bradley made her Broadway debut at New York's Hammerstein Theatre in Ballyhoo. Her next stage appearance came one year later at The Music Box Theatre in The Third Little Show. Soon Bradley found herself working in various New York nightclubs and theatres. 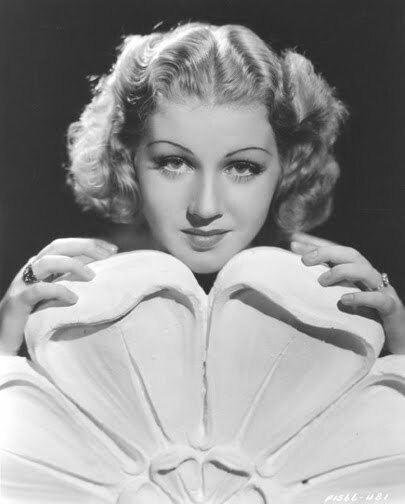 In March 1933, she apperared in Strike Me Pink at the Majestic Theatre. Soon Bradley decided to give Hollywood a try. After she left Broadway her role in Strike Me Pink was taken over by Dorothy Dare, who would later become a musical film star. Although she actually made one film in 1932 her real film career did not begin until 1933 when she starred in a lead role in the film Too Much Harmony (1933). In the 1930s she became one of the periods most popular musical stars and her other screen credits include parts in Girl Without a Room (1933), The Cat's Paw (1934), Anything Goes (1936), Wake Up and Live (1937), Larceney on the Air (1937), and The Big Broadcast of 1938. During her career she co-starred opposite such notable figures as Bob Hope, Bing Crosby, Dorothy Lamour, Alice Faye, Bruce Cabot, William Bendix, Fred MacMurray, Harold Lloyd and W.C. Fields.In May 1937, Bradley submitted to a blind date and met Hopalong Cassidy star William Boyd and the two of them hit it off so well that they were wed in June 1937. In the 1940s Bradley's star began to wain and in 1943 she starred in her last big role in Taxi, Mister. Following this Bradley had officially played out her Paramount contract and she spent the remainder of the 1940s alongside her beloved husband William Boyd and traveled around the country with him helping to promote his cowboy image. She did come out of her publicty trips with Boyd to make one more film appearance; an uncredited cameo role in Tournament of Roses (1954). On September 12, 1972, just nine days before her 59th birthday, William Boyd died and Bradley became a widow. Following his death she retired from the entertainment world; however, since she shared such a strong union with her husband she still continued to do things to help keep Boyd's memory alive. Although she never bore children she considered all the children who enjoyed her husbands work as Hopalong Cassidy to be like her children. She also endured years of fighting for the legal rights to her late husbands sixty-six "Hopalong Cassidy" features. With her acting career behind her she devoted her time to a lot of volunteer work at the Laguna Beach Hospital where her husband had spent his final days. Thank you for passing along the news. As a "Hoppy" fan I have appreciated her work continuing to keep that movie icon in the public eye.